The blue Aisha jumped up at the sound of her teacher’s voice. Did I almost fall asleep there? Haha, wow, I’m so stupid. She hurriedly collected her notes from her desk and skipped to the front of the class. All eyes were on her... well, some of them were staring out the window or looking at something else, but most of them were on her. “You did know you were supposed to write a speech on morphing potions, didn’t you?” Ted, a green Kougra sitting at the back of the classroom, mocked. A few other pets in the class giggled at his comment. “But then I won’t know what to say!” whined Iveh. Iveh mumbled something under her breath, and then continued reciting her speech, her eyes down on her notes. Finally, after what seemed like hours but was really just a minute and a half, she was finished. Half the class was falling asleep. “Applause, please!” Iveh yelled, waking them all up. A few students clapped mindlessly. Iveh nodded, still shocked. She couldn’t fail science; it was her favourite subject. As she slung her heavy schoolbag over her shoulder and made her way out of the classroom, she began brainstorming ideas for her experiment. Iveh bounded up the steps and pushed open the door of her Neohome. The sweet smell of freshly baked cookies greeted her. “I’m home!” she called cheerfully. Her sister Revlemore poked her head around the kitchen door. “Hello, Iveh! Welcome home! I baked some cookies.” The cloud Cybunny held out a tray of warm chocolate-chip cookies. “Mmm! Thanks, Rev!” Iveh grinned as she snatched up one of the cookies and took a bite. “Oh by the way, I have something I need your help with,” she said between bites. “What is it?” asked Revlemore. Iveh swallowed the chunk of cookie she was chewing. “I need to do a really good science experiment over the weekend or else I’ll fail science,” she explained. Iveh grinned. “Good idea! I’ll go steal some ideas from him now.” She headed into her living room and spotted Endiive sitting the plush blue sofa. The young yellow Cybunny had his face buried in a huge book, as usual. He didn’t see Iveh walk in. Smiling mischievously, Iveh snuck up to Endiive and snatched the book off him. Iveh laughed. “Sorry, but it’s funny every time... well, at least I think it is. Your reaction is priceless!” She looked down at the cover of the book. It was pale brown and had Basic Potion Brewing printed on it. She raised an eyebrow. This was exactly what she needed! “Um, can I have it back now?” asked Endiive. “Wait!” Iveh said loudly, flicking through the book. An enthusiastic smile spread across her face. “Yes, yes... this is just what I need...” she whispered. “No, it’s fine. Of course you can borrow it,” said Endiive, slightly disappointed. He really wanted to read it a bit more, since he’d only bought it that afternoon, but he couldn’t say no to one of his siblings... or anyone, for that matter. “Yay! Thank you! Well, now I’m off to mix my own potion! See ya!” Clutching the book excitedly, Iveh rushed upstairs to her room. “Hmm, let’s see... I’ll add a bit of this stuff...” Iveh poured a few drops of purple liquid from an unlabelled potion bottle into the swirling, bubbling mixture inside the clear plastic beaker she was using. “Ah yes, that should do it!” She stepped back and admired her work. There was a knock at the door. Iveh pulled it open, and Revlemore walked in, almost tripping over on a big cardboard box containing Iveh’s collection of keyrings. “Hi, Rev! Wanna see my potion? It’s complete!” Iveh said proudly. Iveh just laughed and brushed off Revlemore’s comment. “What dangerous thing could possibly happen? It’s just a mixture of... well, I’m not sure, really. But I’m going to try it!” Before Revlemore could stop her, Iveh grabbed the beaker and gulped down all the liquid in it. A few seconds passed. Nothing happened. Revlemore breathed a sigh of relief. Iveh jumped up and rushed to the mirror. She stared at herself, shocked, as her tall Aisha ears began to change shape. They twisted into soft pink lips, and sharp white teeth revealed themselves. Her two emerald green eyes merged into one ugly red eye. Her normally small white teeth became a dull yellow, growing into sharp and uneven fangs that barely fit in her mouth. Finally, floppy pink ‘spines’ emerged from her back and her soft cyan fur darkened to a murky blue colour. Revlemore stared at her sister, appalled. She backed away slowly, towards the door. Suddenly the door was pushed from behind, knocking Revlemore to the ground, as their brother Jovial burst in. Jovial calmed down. “Oh, okay. Well, you sure look nice today, Iveh!” he said politely. “It’s truly a miracle,” muttered Neddison, her Halloween Lupe brother, in a sarcastic tone. Iveh grabbed a mouthful of food from Neddison’s plate with her ear. “Hey!” he snapped. “You snooze, you lose,” Iveh teased. “Don’t worry, Iveh, after the teacher gives you your grade for science class you can go back to normal,” her owner, Sarah, reassured her. But a look of worry was present in her deep brown eyes. 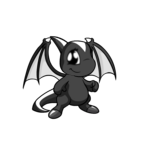 Iveh could almost sense the girl thinking, If I can afford a blue Aisha morphing potion... Money had been rather tight lately, ever since they’d blown all their neopoints on a ‘rare’ tree which, contrary to what the salesman had told them, did not grow paintbrushes. The next morning, Iveh went for a walk in Neopia Central. It was still early, and the warm sun wasn’t quite that high yet. Iveh passed the Rainbow Pool. Pets and owners were crowded around. The owners held expensive paintbrushes while their basic-coloured pets jumped up and down excitedly, waiting for their turn to be painted. Plain pets slid into the pool and emerged beautifully painted. She strolled up to the edge of the pool and looked at her reflection in the shimmering water. I guess I don’t look that creepy, she thought to herself. “Hey, Iveh!” called a voice from behind her. Iveh turned around, and saw Freyalene running towards her. A small group of other baby neopets trailed behind her, trying to keep up. “Iveh, these are my friends. They heard you were a mutant and wanted to see—AAAH!” The group accidentally bumped into Iveh, pushing her into the Rainbow Pool with a big splash. Iveh sat up. She felt different. She looked at her reflection again—she was now a normal blue Aisha. “Oh no! My mutant-ness! It’s GONE!” she cried. Freyalene stared in shock. “I’m so... sorry...” she said quietly. She spun around and glared at her confused friends. “Look what you’ve done! This is all your fault! Not mine! Yours!” she yelled in anger. Iveh pulled herself out of the Rainbow Pool and rushed home. She dashed up the stairs and into her room. Clearing away the junk on her desk, she set out her collection of potions and chemicals and began pouring them all into the beaker she’d used before. Some of them were empty, however. “Must make another weird potion... must get a good grade in science... I will! I know I will!” She began to laugh like a mad scientist as she worked. Monday finally came. Iveh tiredly trudged down the stairs with her schoolbag. But although she was tired, she wore a huge smile on her face. She entered the kitchen, where Sarah was scooping some vanilla ice-cream into a bowl. Sarah turned around, putting down the ice-cream scoop and brushing her chocolate-brown fringe out of her eyes. “G’morning, Iveh. Would you like some breakfast?” Sarah always made ice-cream for breakfast on Mondays. When she finished her ice-cream, Iveh grabbed her schoolbag and the potion she’d made and headed out the door. A few students in the class clapped slowly. “Is that all?” Mr. Noakes asked. “Yes. Would you like to see a demonstration of how it works?” Iveh pulled off the lid and gulped down the mixture. “It doesn’t work,” someone in the class said. Iveh was embarrassed. Mr. Noakes was about to write an ‘F’ with his red marker on Iveh’s report, but suddenly Iveh got a great idea. “It’s a blue Aisha morphing potion!” she announced. Mr. Noakes looked up. “Hmm... that could be true. But of course, we’d have to test it on someone who isn’t already a blue Aisha... Iveh why are you looking at me like that? Iveh?! No! Don't do that!” Iveh splashed what was left of her potion on Mr. Noakes. 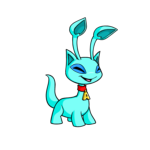 Sure enough, the blue Tonu turned into a blue Aisha. The rest of the class laughed. Iveh beamed. “I didn't fail science!” The rest of the class cheered, and she thought to herself, And I didn’t have to worry about being stuck as a mutant, either! Why would any respectable pet shave their head? Maybe a new trend.